Joe chokes on his mouthful a bit but Henry says it can't be Rupert - Joe's mate found this rabbit on the golf course. Katie explains that Rupert got out of his cage. KATIE: (firmly) I want him back. HENRY: Er...I think it's a bit late, Katie...I'm sorry. BRONWYN: Oh Katie, I'm sure he didn't suffer. KATIE: How would you like it, being boiled alive?! Kerry tells Joe off for eating a living, breathing creature but Joe says it wasn't living and breathing! Henry says, anyway, they haven't eaten it yet! Kerry tells Katie not to think about it - Rupert's rabbit spirit is free now, to roam wherever he likes. Bronwyn says Rupert is in bunny-heaven which comforts Katie a bit. Katie turns to Joe and says that she wants Rupert to have a proper funeral with all his friends invited. HENRY: (trying not to laugh) He has friends? Jim and Rob are chatting about Paul and Gail. Rob is on Paul's side and Gloria is on Gail's side. Jim tells him just to stay neutral. Jim answers the phone to Katie. He says he'll be home soon for the funeral. Apparently half the street are turning up. Harold is babysitting Sky but she keeps crying. It turns out that he hasn't fed her, so he goes to the kitchen to look for something. Scott suggests some mashed pumpkin. 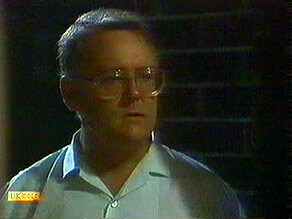 Harold tells Scott that Kerry has gone to dinner's at Joe's. He doesn't mind though as Kerry has told him there's nothing going on between her and Joe. Scott goes off to see Jim, leaving Harold on his own with Sky. 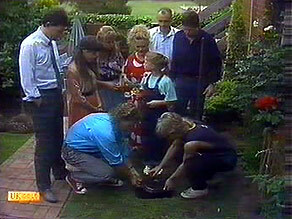 Most of Ramsay Street have turned up for Rupert's funeral. KATIE: We are all here today to say farewell to Rupert. He wasn't with us long! But he was one of my best friends. And everyone loved him. And he didn't have an enemy in the whole world. Except for whoever killed him. Well I'm sure if they knew Rupert well...well, I'm sure they wouldn't have done it. Amen. PS I'm going to miss you so much Rupert! 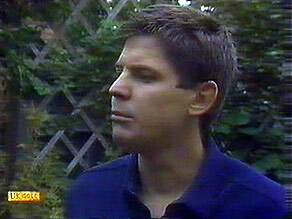 KATIE: I think Mr Mangel should say something, don't you? Joe looks horrified and says he's not very good at public speaking. But Katie is resolved. JOE: Um...I can't say that I knew Rupert the rabbit very well, but I'm sure he was a very gentle and caring rabbit and I'm very sorry that this terrible mistake...had to happen to the rabbit...Rupert...Bye, Rupert! JIM: Perhaps we'd better have the pallbearers. 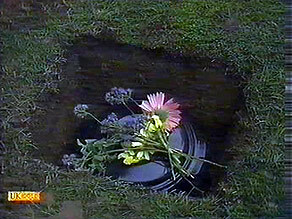 Henry and Joe pick up the casserole dish and move it to a prepared grave(!) 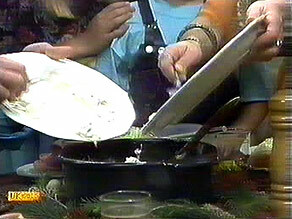 Joe wants to just pour the stew in the hole because it's his mother's best casserole dish! But Kerry says that under the circumstances it's the least they can do. They put the casserole dish in the hole and everyone tells Katie how good the service was. 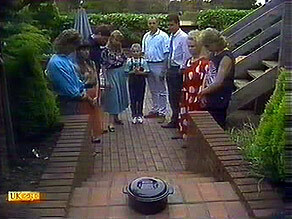 Katie lays some flowers on the casserole dish. KATIE: (tearfully) Goodbye Rupert! I'll never forget you! Sharon and Nick are studying. They mess about and Nick starts kissing her. Sharon tells him he's a terrible influence on her! They're both glad that they're back together though. 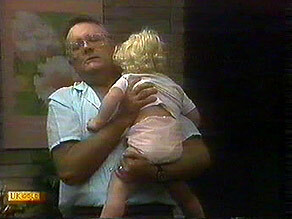 Harold is trying to change Sky's nappy when there's a knock at the door. It's Rob Lewis looking for Madge. Meanwhile Sky tips the talc everywhere. Rob asks Harold if he needs a hand with her but Harold says he's OK. Rob has come to ask madge for advice about Gloria. Harold says that he should just try treating Gloria with a bit of respect for a change and says that why she'd want Rob for a husband is beyond him! (How rude!) Rob walks off, leaving Harold to struggle with the nappy. Scott suggests buying Katie another rabbit, but apparently she doesn't want to be disloyal to Rupert(!) Des tells Jim that he appreciates the heart-to-heart they had, but it was too late anyway. He explains that Penny has gone backpacking in Europe and he'll never see her again. Scott tells Des to just take a holiday and go after her. Des shakes his head though - he says it just wasn't meant to be. Jim says maybe what was meant to be was what happened - Penny brought him out of himself and helped him to get over Daphne. Now Des can get on with living his life. Des says that Jim might be right. Joe has ordered pizza for everyone to replace the rabbit stew! Henry teases Joe about hunting rabbit on golf courses and they all laugh. KERRY: Typical men! A poor, helpless little animal has just been blasted to Adam's and all you can do is joke about it! KERRY: You were encouraging Henry and that's just as bad! JOE: I did not! I think it's an awful thing that happened, Henry. KERRY: You know, when I met you, I thought you were a really nice guy. The sensitive and caring type. JOE: I am sensitive and caring! HENRY: He is...most sensitive and caring. JOE: Oh, shut up, Henry! HENRY: I'm just trying to help you, mate! KERRY: Well I don't believe you, anyway. JOE: I am, I swear! (picks up Kerry's hand) Here. Is this the heart of an insensitive, uncaring bloke? KERRY: It's hard to tell. JOE: Well I'm just going to have to prove it, aren't I? They smile at each other and then Joe kisses Kerry, right there in front of Henry and Bronwyn! KERRY: So how does that prove anything? JOE: Well, it's doesn't. Got to admit though, it's fun! They start to kiss again and Henry and Bronwyn start to feel like gooseberries! HENRY: Look, er, we'll see ourselves out...! Harold tries to comfort Sky by playing classical music and bounces Sky around (enough to make anyone cry!) Harold says aloud that Kerry had better be home soon! Des comes in and find Henry and Bronwyn kissing on the couch. Des tells Henry he's been a bit depressed and he's sorry for taking it out on Henry recently. He says it's good having Henry in the house. Henry says it's lucky that they hadn't eaten the rabbit stew when Katie caught up with them, otherwise she'd have had all of them buried out the back! Harold is telling Sky a story, but she is still crying. Scott comes in and looks puzzled at Harold's rather politically-correct story(!) Harold moans that Kerry isn't home yet. He gives Sky to Scott while he goes to get Kerry. Katie has had a bad dream about Rupert! She's upset that Rupert's death is her fault because she left the cage open. Jim says it was just a nasty accident and Rupert is definitely in bunny heaven. Harold raps loudly on the door. Joe answers the door without a shirt on and doing up his trousers(!) He tells Joe that he's come to look for Kerry because Sky is missing her. At that moment Kerry comes out with rumpled clothing. Harold looks horrified.